1. Casts. Fakes are most commonly made from resin casts (or other rock-like material) of real fossils, and you can sometimes tell by the lighter weight of the cast. Resin gleams when exposed to UV light, while a real mineralised fossil has the same UV reflection characteristics of surrounding matrix. The surrounding matrix may be too even, and the cross section may not show sedimentary rock layers. 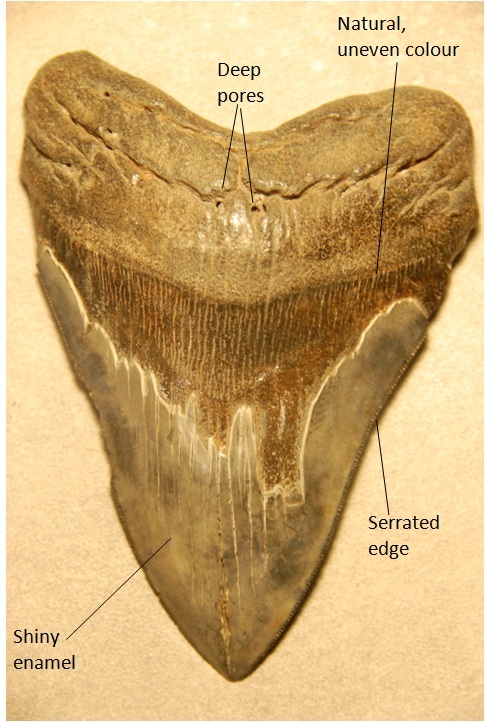 A magnifying glass on the organic material of a real fossil can sometimes show natural transitions between colour variations (as seen in the Megalodon tooth specimen above), which will look different on a painted fake. Scratching the surface will remove the colour of the paint. Under magnification, you should be able to see crisp detail and deep pores on the surface. Be careful of sellers whose inventory of similar fossils look exactly the same. 2. Piecemeal assemblies. Fossils parts are sometimes combined to form the illusion of a complete skeleton. Even an entirely ‘new’ species may be created with the parts from different species, as seen in the 1999 archaeoraptor hoax that befuddled National Geographic and even famous paleontologists. Orientations of the rock or bone grain can sometimes be inconsistent. Glue to replace parts can be obvious. Fossils glued together from different specimens may glow differently under UV light. X-Rays, MRIs, and CT scans can also help to distinguish vastly different bone density among the component parts, although these may not be practical in many cases. 3. Modern animals in disguise. Skeletons of modern animals are sometimes painted and set in artifical matrix and sold as fossil. A telltale sign is the teeth, which tend to be whitish in modern animals and coloured like the matrix mineral in an actual fossil. The weight of modern bone tends to be lighter and sometimes hollow. You may sometimes identify tiny knife cuts in the fakes, from the skinning process. 4. Wholesale works of ‘art’. Skilled craftsmen, frequently from China, have fabricated fossils (e.g. turning fossilised fish into lizards, glueing real bones / dinosaur eggshell fragments together to form a whole, or attaching ‘eyes’ or ‘spines’ on trilobites to fetch higher prices) and even carving completely fake fossils or crushing real fossil bone to mold new body parts, as most commonly done for keichousaurs. Sometimes pictures of fossils are even painted on plan rock slab, and lack the distinct anatomical detail that a magnifying glass will throw up in a real fossil. Nature’s detail such as the compound eyes on a Phacops trilobite fossil or the serrated edges on a tooth (see above) are difficult to simulate convincingly. A skilled eye will notice when they are carved into the wrong rock types or represent erroneous anatomical detail. 5. Fake amber. Copal is commonly sold as the hardened tree resin amber, but is in fact a younger resin of just a couple hundred years old. Plastics are also used to create fake amber. True amber may be verified in the laboratory with carbon dating, mass spectrometry, melting point, refraction, or weight. Acetone will dissolve copal, not true amber. Under UV light, amber emits a blue glow, while copal will not exhibit any change. Amber will float in water, while many plastics will sink. When cut, amber fractures but plastics can be easily shaved. In my view, the ideal solution for spotting fakes to to really be exposed as much as possible to genuine fossils (note that even museums frequently carry fakes unknowingly), acquire an eye for basic anatomical and taphonomic detail in various species, demand the provenance information of any fossil, and get together with fellow collectors to handle more fossils, so as to gain a feel for the real thing! This entry was posted in Uncategorized and tagged amber, archaeoraptor, keichousaurs, megaloldon, trilobite. Bookmark the permalink.